GroupFire enables your organization with the ultimate pocket directory. Searchable. Browsable. Always up to date. When Members log in they can easily view this directory and start engaging! User editable profiles! Your members will update their profile photos and any profile information - addresses, contact information, biography, all of it! Searchable: All text in the profile is searchable. Not just keywords! Search is instant - as you type, the displayed list of members changes to those matching with each keyclick. That’s power! Browsable: Organizations have groups, and sub groups and specialties. Your users have access to browse a hierarchical listing of your groups and the people inside them. Expose your organizational structure, easily, on demand, instantaneously. Positions: Members may have titles and positions in your group. 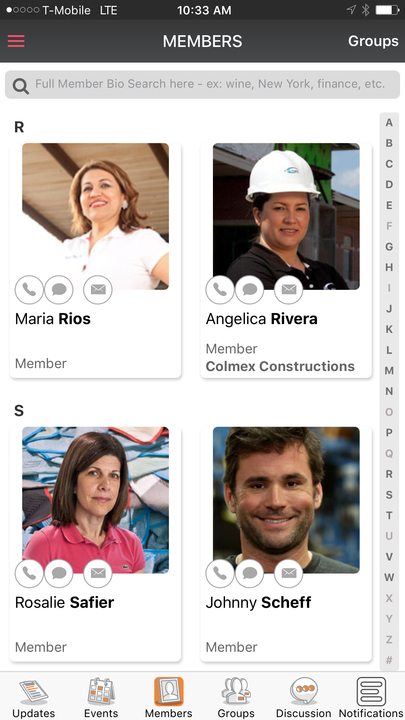 Make your key personnel and members easily locatable. Easy contact: Big buttons for email, sms and phone calls! Make those connections happen. Big Photos: Your members are people! Show off their personality with beautiful large format photos!